Admission: I cooked with oil tonight. A negligent amount, but it was in the meal nevertheless. 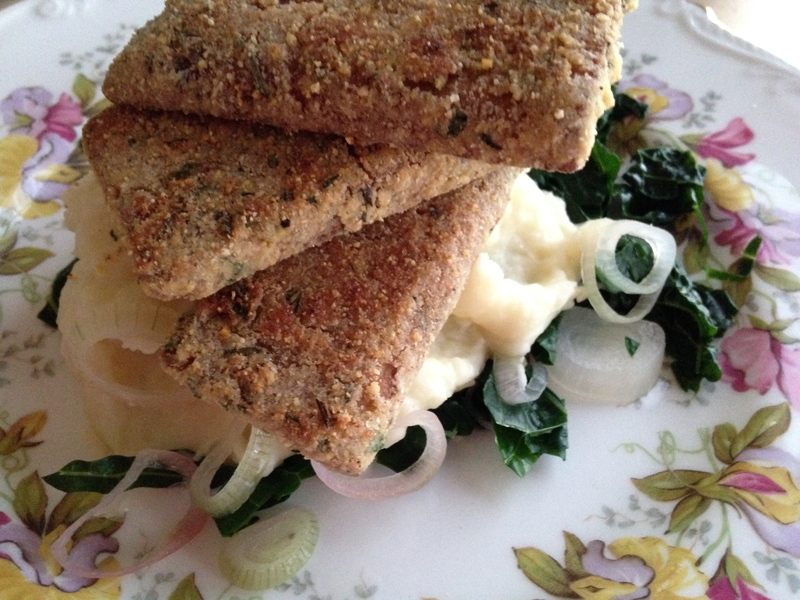 I wanted the tempeh to be crispy but the cornmeal was a little too dry. With a few minutes to go, I sprayed it with some sunflower oil. And, I added Earth Balance to the mashed potatoes. I did say that potatoes need oil! The amount of oil was de minimis and it did not effect the way we felt after eating. Steam the tempeh in the tamari and water for about 20 minutes. Let cool and then cut in half, half again and in half again to make 8 small rectangles. Set up a breading station by pouring each element into a bowl. These measurements are not exact. You have to use your judgement. Dredge the tempeh in the flour, then the milk and then the cornmeal. Place on a baking sheet and bake for 25 minutes in a 350 oven. Spray the tops with sunflower oil and cook for another few minutes, until the crust starts to brown. Peel and cut potatoes. Place in a pot and just cover with water. Peel the garlic and add to the pot. Bring to a boil and then simmer until just tender. Strain and then return to the pot. Use a potato masher to mash everything together with as much vegan milk and Earth Balance as needed to make it creamy and a pinch of salt. Slice the shallots. Place in a pan with 3 tablespoons of water and cook until softening. Take the center ribs out of the kale and chop. Blanch in boiling water for 1 minute. Add to the shallots and and season with a pinch of salt.